This one is to move into the 6th seed. It' would be great to get the 6th seed as I think the Nuggets are the best first round matchup. Can The Rockets sobers up from clinching the playoff and still hungry to win against Memphis? two days rest should be able to cool them down a little bit. Expecting good game tonight! Etane! can I ask you a question? Just one layman's opinion... I don't think the Rockets stand much of a chance in the playoffs against Denver. They might pick up a win or even two but they are (I hope I am wrong) no match against the high flying (both speed and altitude) Nuggets. 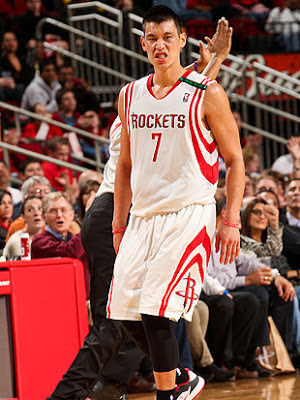 Jeremy Lin is the only guy that scares the Nuggets. The rest of the Rockets, including James Harden, are sorely overmatched. George Karl knows that Lin is the one guy on the Rockets that gives the Nuggets real trouble. has to say about the upcoming playoff picture. Agree with Knibb... they are faster and stronger, and deeper. In fact they swept the Rockets this year. So not sure where you are basing you're statement of the "best matchup" on, JLinfan. Oklahoma probably the best of the 6, 7, or 8 spot match ups for the Rockets. That expression was captured in one of the game before. :) Forget which one. If the Rockets big men get tough, they can win this game. Last game, the Bruise Brothers (Randolph and Gasol) totally dominated without having to do anything. The Rockets big men were absolutely quaking in fear of those guys. All night, the Rockets big men kept a respectful arms distance away from those two when they established position and also were afraid of going to their usual spots out of fear of being hit along the way. This is where the Rockets could use a tough guy enforcer who steps up and enjoys the physical bashing. There's a little known player out there who would be perfect for such a role on the Rockets. Ex Jazz center Kyrlyo Fesenko (can't remember his name and I'm too lazy to look it up) is a hardened pro who came up in the Russian league and played some bruising minutes in the NBA. If I had Fesenko on the Rockets and I was coach, I'd sub him in against either of the Bruise Brothers early in order to set the physical tone. Then I'd yank him in favor of the Rockets' pretty boy power forwards and put Fesenko back in only when the pretty boys soften up later in the game! That's just it, they don't and its probably way too late to do anything about it. Here's what I think: Either way Rox isn't going to make 2nd round, I seriously doubt we can beat any of the top 4 in a 7 game series. They are either way too deep (Clippers, Nuggets), with much better coaching (just about all 4), or is just flat out better at teamwork (Spurs, Nuggets). Doesn't matter if we beat them once in regular season, come playoffs they will have their A game. And well, Rockets won't be playing their A game because Harden will continue to tank on defense, and McHale still refuses to let Lin loose instead prefers Harden's ISO-until-shot-clock-has-3-secs-left-then-look-for-bailout offense. BTW people needs to stop hating on Isiah. What he said was correct, HardLin can become the best backcourt in the NBA if Harden just starts playing defense. But of course getting Harden to play D...That's a different set of problems. That's not Harden's problem. It's McHell's. He's the coach. If he doesn't bring the hammer down on Harden's lack of D, no one will. I don't think it's mostly that that the Rox are overpowered by Memphis' frontcourt. It's more that all the Rox PFs (Smith, TRob, DMo) are rookie defenders who get confused by even simple offensive actions/plays and don't end up where they are supposed to. In the last game, there was a sequence of 4 plays in which Memphis either attacked TRob directly or indirectly cuz he didn't know what he was doing. I'm not talking about TRob getting moved by Zach (though that happened too) but his being out of position. It was TRob who had the most defensive breakdowns against Memphis, followed by Harden who didn't even look at Allen making cuts to basket. The rookie "raw talent" PFs miraculously played like seasoned pros when Harden was sidelined. Trob on the other hand is clueless with or without Harden. In the last game, there were also several plays in which Conley was getting screens at the far left sideline, and bc of the jumble of bodies there, no one ended up stopping him from going all the way down the sideline, drawing a help defender, and passing to a rolling big. The Rox are just inexperienced on team defense, and the coaches didn't adjust to what Memphis was doing for some time. The coaches got burned 3 times with variations of that play before they called timeout. I think Rockets have a better chance against spurs, even if they are #1 seed. Spurs play much slower and Houston youth can outplay them. Thunder may guve them a problem because they have good shooter like Durant n westbrook are fast and athletic. Denver will b the toughest matchup for the because they are equally fast in all positions n they can flatout shoot a we can see from the last game. Also houston has not won a game against Denver. I agree. I think people also underestimate the significance of the "thin air" home court advantage that Denver enjoys. Physiological adaptation consisting of more RBC and increased lung capacity lasts several weeks. Denver doesn't have the best record at home in the NBA by sheer coincidence. …and yet a losing record on the road. great point about Denver's home/road record. I think the Nuggets are too tough a matchup for Houston because Denver will easily shut down Harden and the Rox big men play passive against the large Nugs bigs and Faried. At best the Rox win 2 games against Denver. Jeremy will do fine against Demver but he can't beat the whole team by himself. On the other hand, I think their best chance is against the Spurs because they can run them silly and JLin will hold his own against Tony Parker. Against OKC I think the Rox matchup better than they do against Denver but not as good as against the Spurs. If the Rox play the Spurs, Rox win 4-2. If they play OKC, Rox lose 4-3 and if the Rox play Denver, they lose 4-2. What about the Clippers, Spencer Haywood? Clipper will be the best matchup for rockets but it hard to get to the 5th seed. They only have to stop griffin and JLin can keep a lid on CP3. I would love this matchup if it could happen but avoid Denver!!! In my opinion, Nuggets are the worst matchup for the Rockets. Yes as we have seen from 4 game and all a lost. If spurs drop to 2nd seed I think Rocket should trid to stay at 7th seed or 8th if they are still at 1st. Yeah that’s why I hope Jeremy plays great tonight (of course) but let’s not try too hard to beat Memphis. Once we move ahead of or tie GSW in the standings, they probably won’t let us move back down to the 7th seed cause they don’t want to face Denver either. The Rockets can avoid Denver and aim for San Antonio if they so choose. If they don’t, Morey is not as bright as advertised. - Rockets' Patrick Beverley says LeBron James & Tony Parker have complimented his game. "It's been good, but I like to stay extremely humble." - [Rockets' Patrick Beverley] says he's heard good things from Tony Parker. "He mentioned how happy he was to see me in the NBA where I belong." - [Rockets guard Patrick Beverley] was asked: is there anybody's shot u will not try to block? "No. I will try to get anybody's shot right now." Parsons out tonight vs Grizzlies, Delfino in. This is a typical scenario from recent previous games. The attacker is fake dribbling Harden at the left side outside the 3. The pg goes right past Harden but Lin realises the danger, comes in to help and funnels the attacker to the middle. But the attacker goes quickly through and lays up on the right hand side with Askik/TRob never leaving the ground. With this poor defensive system, lead by Harden and the non-athletic tall men, the Rockets will leak critical points. Opposing teams will target Harden or post up whenever important points are needed. On the defensive end they only need to double team Harden or stop Lin's drives to stop Houston from shooting, who will throw up desperate 3's to survive. Realistically, Rockets have no hope in the playoffs because McHale does not seem to have alternatives. But can you blame him, Rockets are the cheapest and youngest team now playing the most highly paid teams with the greatest amount of experience with the best coaches. Final answer: Landry, Novak, C.Hayes, Ish Smith, J.Taylor, Lin, Carroll, B.Jones, Conroy, B.Jackson, J.Williams. Sent DM to winners. I give the Rockets no chance in the playoffs because they're different than the regular season in that you play the same team 4 to 7 games in a row. It's almost like having 7 to 13 half time adjustments. And that's where McHale will get outcoached big time. Plus, the Rockets playoff starting lineup will have only started together a few games. So I'm setting my expectations really low and just hoping that Lin will have good games and close the 4th quarter. I agree with you, but to the extent that Lin “coaches himself,” the playoff format gives Lin the opportunity to really study his opponent, find their weaknesses, and make his own adjustments. I’ve always thought that Lin’s intelligence was one of his many advantages. NATE ROBINSON DISCOUNT DOUBLE-CHECKING NOVOKAINE.